Rudraksha beads 6 mukhi (six faced), size: 5mm. 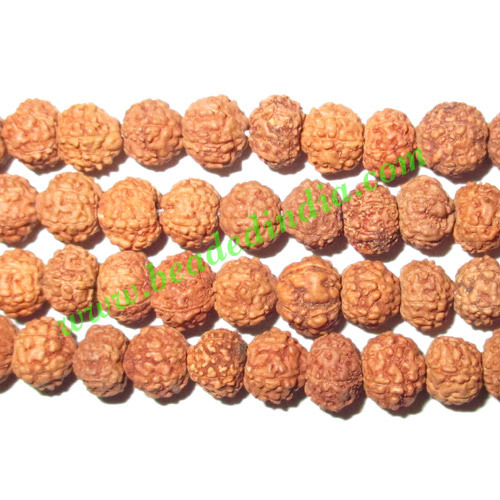 The 6 faced rudraksha beads are useful in increasing love, kindness, attraction; and curing sexual diseases, mouth disease, urinary, neck, dropsy, Cancer, organ failure, kidney, throat, indigestion, arthritis, eye, nerve vein related, thyroid etc. Leather Cords 3.0mm (three mm) round, regular color - dusty plum. Silver Plated Toggle Clasps, size when expanded: 38x31mm, weight: 4.5 grams. Copper Metal Beads, size: 12x10x4mm, weight: 0.71 grams. full sleeve long khadi yoga kurta, size : chest 48 x height 34 inches (large). Silver Plated Headpin, size: 1.5 inch (38 mm), head size : 7mm, weight: 0.31 grams.